"Look! On that plate! It's French toast! It's a pancake! No! It's French toast pancakes! 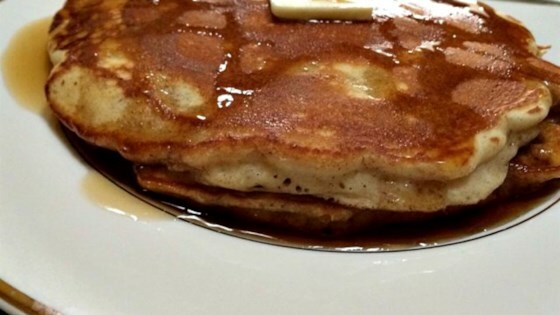 A family favorite as we can never decide on French toast or pancakes. Great for holiday breakfasts to keep the kids from snitching." Heat 2 teaspoons oil in a griddle or skillet over medium-high heat. Whisk flour, sugar, baking powder, baking soda, salt, nutmeg, and cinnamon together in a bowl; make a well in the center. Beat milk, egg, 2 tablespoons oil, and vanilla extract together in a separate bowl; pour into the well in the flour mixture and stir until batter is smooth. Drop about 1/4 cup batter per pancake onto the griddle and cook until bubbles form and the edges are dry, 3 to 4 minutes. Flip and cook until browned on the other side, 2 to 3 minutes. Repeat with remaining batter. These will turn out darker than normal pancakes because of the ingredients for the French toast flavor. They need a slightly more careful eye. My family loves this recipe! Has a true French Toast flavor. It was super simple and taste great!!! Must make again!